Kylie Minogue has sent a personal message to an injured ambulance volunteer who missed her concert after being hurt in a stock car crash. St John Ambulance worker Bryony Charles was hit by a stock car at Foxhall Stadium, Ipswich last week and is still in hospital. Friends contacted Kylie ahead of Friday's show at Newmarket Racecourse. Debbie Charles, Bryony's mother, said: "It's just shown that people do care and messages of support will help." Bryony was one of three people injured when the car lost control and hit two St John Ambulance volunteers and a forklift truck driver. She had been due to volunteer at Kylie's outdoor concert in Cambridgeshire and was "devastated" to miss it, her mother said. 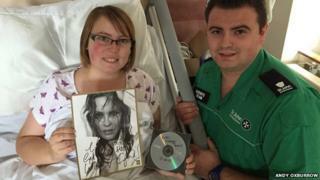 The pop star sent a signed photograph and a personalised video message on disc to the 23-year-old's hospital bed. "For me it was extremely emotional and I think I cried more than she did." Andy Oxborrow, Bryony's partner and a fellow ambulance volunteer, said she had been "surprisingly cheerful" since the accident. "I knew my girlfriend was strong but she really has amazed me. She is so strong," he said. Mrs Charles said Bryony's ankle had been pinned in an operation and she will need further surgery on her right leg. Forklift driver Bob Ellis, who needed 24 stitches in his legs after the accident, is "on the mend and in good spirits", his wife said. The other St John Ambulance worker involved was treated at the scene for minor injuries.